Breaking Through With Georgiann » Blog Archive » Why are you here? Do you know who you are and why you are here? Do you know what your mission in life is? Are you aware of the daily guidance from your soul? No matter how great your outer success is, if you do not know the answers to these questions, you might feel that something is missing in your life. 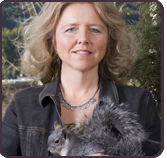 A visionary bridge builder between nature and humankind, Catriona MacGregor helps people connect to nature and their own spirit through vision quests, shamanic journeys, spirit animal discovery, and nature-based coaching. She is a wise woman who weaves her many life experiences, spirituality, and intuition into a tapestry of hope.